Are you doing work that matters to you or are you still trying to figure that out? 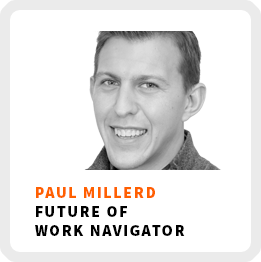 Paul Millerd spends a lot of time thinking about and helping people like you find work that matters to you. He recently launched, Boundless, a suite of services to help people and organizations navigate their future of work including consulting, coaching and courses. He also has a blog and podcast of the same name. How to evaluate all of your different skills and how they can be mashed into different ways to find new opportunities. How to create your own definition of success and how Paul defines his. Redefining risk to think more about the consequences of not doing what you know you need to do. Sacrificing money or career opportunities to spend time with family and building relationships. And what the gift economy is all about. Wake up time: When his body wakes up. Superpower: Digging into topics very deeply and synthesize that information for others. Definition of success: Being able to focus on his health. his family, and doing work that energizes him. Regains focus by: Disconnecting from work to spend more time with family and friends or just generally doing other things. Book recommendation: Anything You Want by Derek Sivers, Man’s Search for Meaning by Viktor Frankl, and Survival in Auschwitz by Primo Levi. Favorite productivity tool: Not watching the news. 90-day goal: Live a good life by focusing on health and relationships. Where he likes to think: Walking out in the world, with good views and no plan. 1) Reflect back to times like college when you may have lived on a lot less money and still enjoyed your life. 2) Create a spreadsheet to list basic needs as a way to quantify a baseline.